Tensions are mounting within the youth wing of Fine Gael. 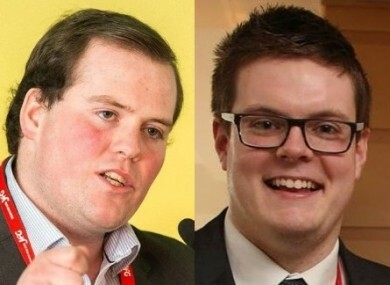 Colm Taylor (left) has replaced Padraig O'Sullivan as president of Young Fine Gael. THE ENTIRE LEADERSHIP of Young Fine Gael will face motions of no confidence next month unless they resign in the coming weeks with indications that each of 12 members of the party’s national executive council will be ousted. It follows the sudden and mysterious departure of the Fine Gael youth wing’s president Padraig O’Sullivan just over a week ago after members of the YFG national executive visited his home and issued him with an ultimatum to either resign or face being forced out. O’Sullivan’s sudden resignation has prompted a crisis within the 4,000-strong youth political party which was founded by Garret FitzGerald nearly 40 years ago and counts Leo Varadkar and many current Fine Gael TDs among its former members. Vice president Colm Taylor has assumed the presidency of YFG but beyond a statement issued on Wednesday neither he nor any of the national executive have made any public comment. A national assembly has been scheduled for 28 November in Portlaoise where matters are expected to come to a head. In a strongly-worded letter, signed by over a dozen YFG branches around the country and seen by TheJournal.ie, members have called for the entire national executive to resign or face individual motions of no confidence. The letter also calls for a detailed report and possible investigation into the events surrounding O’Sullivan’s departure. It registers considerable outrage at the events of recent months, and refers to the ousting of O’Sullivan as “a revolting House of Cards scheme”. Taylor and other national executive members have not responded to repeated requests for comment from TheJournal.ie this week. O’Sullivan has also not responded to requests for comment. The national executive met on Tuesday night to discuss recent events but it was 24 hours before a statement was issued on O’Sullivan’s resignation. Taylor is understood to have phoned around YFG members on Wednesday in an attempt to put forward his and the executive’s side of events. But the statement issued to all members made no reference to the reasons for O’Sullivan’s resignation. This has considerably angered YFG members who have sought a more detailed explanation on the party’s Facebook group, YFG National Discussion Forum. However, one member of the executive said they would not be commenting publicly because they feared their remarks would end up in this website’s reporting of events. “We aren’t in a vacuum, external media watching us now,” they wrote. The YFG constitution states that a motion of dismissal against an executive member requires the support of 75% of members who attend the national assembly. The tabling of a motion requires the support of at least five branches and a regional council and must be submitted two weeks before the meeting takes place. One prominent YFG member told us this week that there was no controversy that justified “this form of anti-democratic removal of Padraig”. They predicted there would be heated scenes at the national assembly next month. Another YFG member said that the events of recent days were an “utter f***ing shambles”. Email “'Appalled' members will try to overthrow Young Fine Gael's entire leadership next month”. Feedback on “'Appalled' members will try to overthrow Young Fine Gael's entire leadership next month”.